This was the first beer label Shannon drew. It is for our Blue Ox Bock. It was named the Blue Ox because our friend Gabe was in town and helped with the brewing. You may still be confused as to what Gabe has to do with a blue ox - well I mis-remembered Paul Bunyan's blue ox's name. 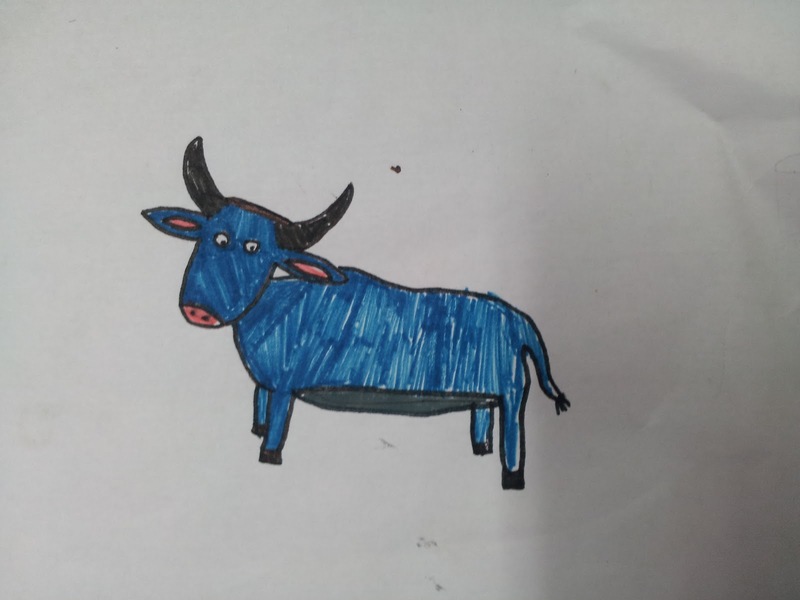 The blue ox is actually named Babe. Anyway Gabe is a big guy; so he is kind of Paul Bunyan-esque so it still works out in my mind - thus we have our Blue Ox. So far this is the first and only beer we've experimented with the recipe. As the boil was happening I found a dark chocolate bar in my cabinet - it was a pretty big bar but it had a low fat content while still having a decent sugar content. I think it was a Ghirardelli bar. We tossed it into the boil and we lucked out as it tasted pretty good. As the beer warmed up a little the chocolate notes really popped out nicely. When drinking either it seems to work out best if you let them sit out of the fridge for 10-15 minutes before drinking. They will be less cold but more of the chocolate flavor comes out.